• Runout data more akin to the British releases e.g. this release. • Runout Side D: The data string here appears not to feature on any other release in the Discogs database. Gatefold opens to view a matt finish inner spread. 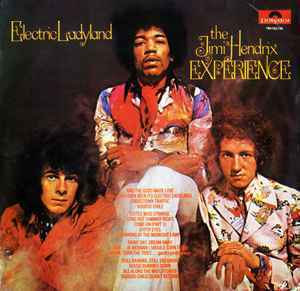 Hendrix portrait on left-hand side (Front cover behind it). Small sepia images of Redding & Mitchell on right (Back cover behind them), with white tracks/credit text below them. Plain white paper inner sleeves with poly inserts. No design Patents credited. This release is auto-coupled as A,D & B,C. So first record (184 183) contains sides A and D, second (184 184) sides B and C.
Defect in matrix stamping on this early issue, altered by hand.